Venerable Carlo Acutis, as an expert catechist, had continually sought to find increasingly new ways to help others reinforce their faith. For this reason he bequeathed to us as an inheritance his Exhibitions, among which is the very notable one on Eucharistic Miracles. It was precisely in 2002, while visiting the expositions of the Meeting of Rimini, that Carlo had decided to organize an exhibition on the Eucharistic Miracles recognized by the Church. A demanding commitment in which even his family members were involved for nearly two and a half years. The spiritual effects being brought about by this Exhibition were unpredictable on the eve of the project. To this day we can affirm that the Exhibition has been hosted in all 5 Continents thanks to the generous contribution of several very special people, among whom stand out the members of the Real Presence Eucharistic Education and Adoration Association who assisted so very much in this undertaking. 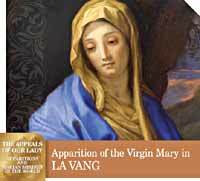 Finally in 2014 we have succeeded in bringing also to completion this exhibition, dedicated to the Virgin Mary, which Carlo had initiated in 2006 but was unable to finish due to the sudden onset of a fulminating leukemia that brought him to Heaven within a few days. 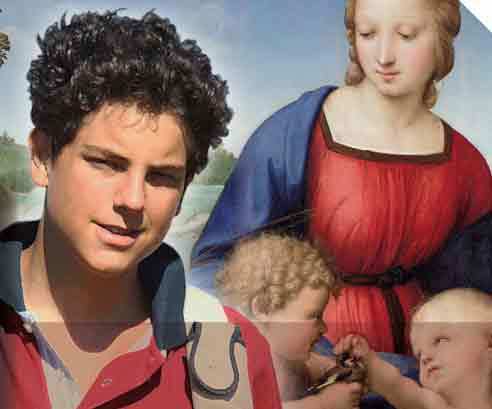 The young Venerable Carlo Acutis was profoundly marked in his spiritual journey by the Virgin Mary, "humble and high beyond any creature" (Dante Alighieri), and he established from the inception the objective of imitating her in all of her virtues. The Virgin Mary was for him the highest example of purity and of unconditional love for God. Mary Most Holy revealed to mankind the image of that which the Church, a wanderer upon the earth, will be one day  at the end of this world. We know that for each Christian, holiness is achieved only through an intense life of Faith, Hope, and Charity. 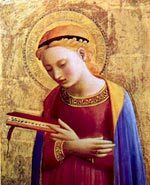 Of all three of these theological virtues, Carlo wrote that Mary "is an exemplary model and her example of faith, supported by her perfect charity, must encourage us to continue in our journey toward holiness regardless of our fragility." Upon hearing the message of the Angel who announced to her the birth of the Savior who was coming to establish the Kingdom without end and the Covenant between God and mankind, Mary with her "Yes" gave us the perfect sacred image upon which to model our life too. The sublime fruit of her cooperation with God's plan of redemption was her universal motherhood: "For this reason she became a Mother for us in the order of grace." (Lumen Gentium, 61). In union with Christ and submissive to Him, she collaborated in obtaining the grace of salvation for all of humanity, in a unique and unrepeatable way. Suffering with Him dying on the Cross "she cooperated in a very special way with the work of the Savior" (Lumen Gentium, 61). 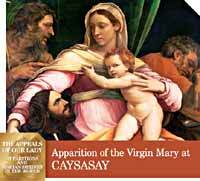 How can they be ignored", he often asked, "the appeals that Our Lady gave us? And yet", he said, "knowing our little Faith, in her maternal goodness, the Blessed Mother wanted to work countless numbers of miracles precisely to help us to believe, yet despite these amazing signs many, still today, remain so indifferent!" 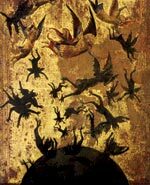 Carlo used to say that "many people seek signs from Heaven to reinforce their Faith, but there are also many who unfortunately do not even seek them and if by chance they find them, intentionally ignore them because they are too preoccupied with worldly things." However, he never lost spirit, because he nourished in his heart the ever lively hope that, sooner or later, the Guardian Angels would have created favorable circumstances in order to sensitize souls that were distant from God to embark upon a life more consistent with His Laws. Our wish, like Carlo's, is that through this exhibition many will rediscover the path which leads to God and that they, too, are able to become bearers of light to all those who are still in darkness. Who is Mary Most Holy? is a daughter of Israel, a young Hebrew from Nazareth in Galilee, a virgin betrothed to a man named Joseph, of the house of David (Lk 1:26-27). She stands out among the poor and humble of the Lord, who confidently hope for and receive salvation from Him. With her the exalted Daughter of Sion, and after a long expectation of the promise, the times are fulfilled and the new Economy established (LG, 55). 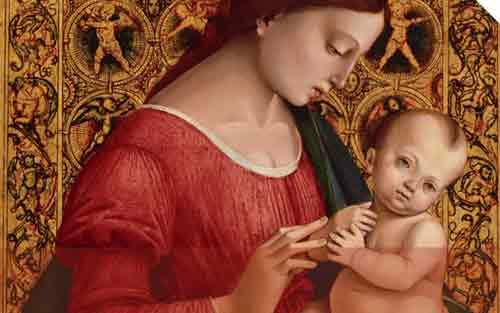 What is the relationship between Mary and Christ? Jesus Christ was conceived in the womb of the Virgin Mary. How did this conception come about?
) The Holy Spirit, the Lord, the giver of Life, is sent to sanctify the womb of the Virgin Mary and divinely fecundate it, causing her to conceive the eternal Son of the Father in a humanity drawn from her own (CCC, 484-485). The virginal conception indicates that Jesus is truly Son of God. What does Immaculate Conception mean? God freely chose Mary from all eternity to be the Mother of his Son. In order to carry out her mission she herself was conceived immaculate. This means that, thanks to the grace of God and in anticipation of the merits of Jesus Christ, Mary was preserved from original sin from the first instant of her conception (Compendium, 96). In what sense is she All Holy? In the sense that she was never corrupted by sin during her entire existence; she is free from all stain of sin, as though fashioned by the Holy Spirit and formed as a new creature (LG, 56). She is full of grace (Lk 1:28). Christian faith affirms the real and perpetual virginity of Mary, even in the birth of her only Son Jesus. She remained a Virgin in the conception of her Son, Virgin in his birth, pregnant Virgin, Virgin mother, perpetual Virgin (St Augustine). Mary is a Virgin in body and Virgin in heart: Mary, during her entire life, entrusted herself always and totally to the will of God; she was always the handmaid of the Lord (Lk 1:38). Therefore Mary is more blessed in receiving the faith of Christ, than in conceiving the flesh of Christ. (St Augustine, De sancta virginitate, 3,3). 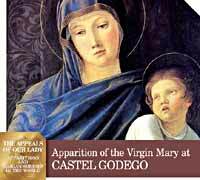 The virginity of Mary also indicates the absolute and gratuitous initiative of God in his dealings. After the birth of Jesus, Mary had no other children, remaining ever-virgin before, after and during the birth. Why does Sacred Scripture speak of brothers and sisters of Jesus? It was usual in the Old Testament and also among the contemporaries of Jesus to call also near relatives brothers and sisters. Besides this, even in our own day, priests address the lay faithful calling them brothers and sisters, in order to show the special bond which unites all in Christ Jesus. 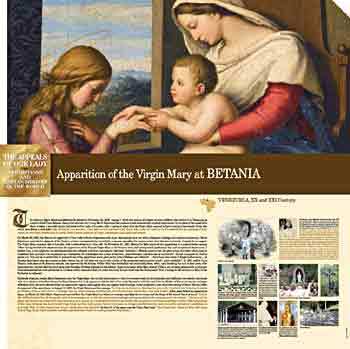 What was the relationship of Mary to Jesus? 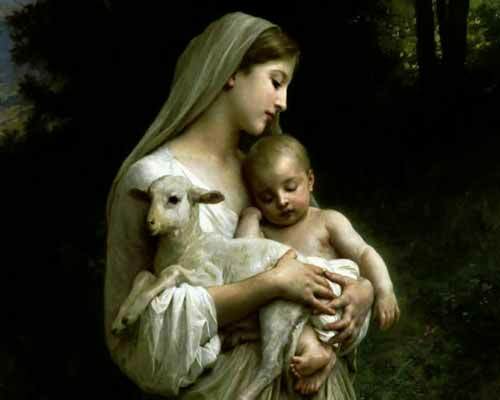 Mary, during her whole earthly life, always maintained a special relationship with her Son Jesus. The earthly life of the Mother of God was in fact characterised by its perfect harmony with the person of the Son and by a total dedication to His redemptive work accomplished Embracing Gods salvific will with a full heart and impeded by no sin, she devoted herself totally as a handmaid of the Lord to the person and work of her Son, under Him and with Him, by the grace of almighty God (LG, 56). She was a faithful disciple of Christ. Even the answer of Christ  Who is my mother? She is whoever does the will of my Father (cf. 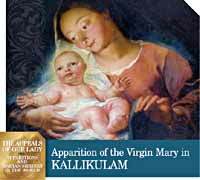 Mk 3:33-35)  which seems a little offensive with regard to His Mother, in reality expresses the greatest praise towards Mary, indicating that her true greatness exists really in the fact that Mary, before and more than any other human creature, put the will of God the Father into effect. What are the Marian dogmas? The Divine Motherhood of Mary (the title Mother of God, Theotokos, was given at the Council of Ephesus  431AD). Her Immaculate Conception (Pius IX, Ineffabilis Deus, 8 December 1854). Her perpetual virginity (Lateran Council  649AD). Her Assumption into heaven (Pius XII, Munificentissimus Deus, 1 Nov 1950). 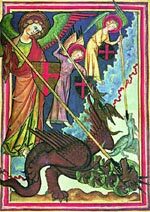 These dogmas, even though proclaimed later in the history of the Church, are contained in Divine Revelation and known by the faith always believed since the origins of the Church. They serve to define that faith in a more precise, solemn and definitive way. The Churchs Magisterium exercises the authority it holds from Christ to the fullest extent when it defines dogmas, that is, when it proposes, in a form obliging the Christian people to an irrevocable adherence of faith, truths contained in divine Revelation or also when it proposes, in a definitive way, truths having a necessary connection with these (CCC, 88). Dogmas are lights along the path of faith; they illuminate it and make it secure. Conversely, if our life is upright, our intellect and heart will be open to welcome the light shed by the dogmas of faith (CCC, 89). In what sense is Mary called the Mother of God? The Church proclaims Mary Mother of God in so far as Jesus, who is truly her son according to the flesh, is the Son generated from the eternal Father in the divine nature, the second Person of the Most Holy Trinity: God himself. 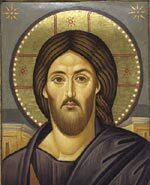 Jesus Christ is naturally Son of the Father as to his divinity and naturally son of his mother as to his humanity, but properly Son of the Father in both natures (Council of Friuli, Symbol, AD 796). What does the Assumption of Mary into Heaven mean? a unique anticipation and prefiguration of our resurrection, which will take place at the end of time: she shows to us the meaning and the destiny of the body sanctified through grace. In the glorified body of Mary, the material creation itself begins to have something of the resurrected body of Christ. 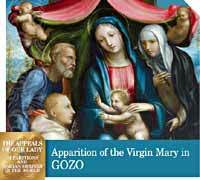 What is the relationship between Mary and God the Father? 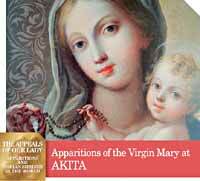 The marvellous works accomplished in Mary are the fruit of the great and gratuitous action of God the Father. 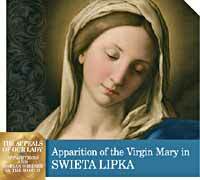 To Gods free gift of grace and salvation, Mary responds with her ready and total adherence of faith. Blessed is she who believed that the promise made her by the Lord would be fulfilled (Lk 1:45). From the beginning, Mary has constituted the great sign, with her maternal and merciful gaze, of the closeness of the Father and of Christ, with whom she invites us into communion. (Puebla Document, n. 282). Choosing her as Mother of all humanity, the heavenly Father wanted to reveal, so to speak, the maternal dimension of his divine tenderness and of his care for men of every age. What is the relationship between Mary and the Holy Spirit? The mystery of the Virgin Mary highlights the action of the Holy Spirit, who effected in her womb the conception of the child and continually guided her life. The titles of Consoler, Advocate, Auxiliatrix, attributed to Mary by the piety of the Christian people, do not obscure, but exalt the action of the Holy Spirit and dispose believers to benefit from his gifts. The cooperation of Mary with the Holy Spirit, manifested in the Annunciation and in the Visitation, expresses itself in an attitude of constant docility to the inspiration of the Paraclete. As a true woman of prayer, the Virgin called on the Holy Spirit to fulfil the work begun in the conception, that the child might grow in wisdom, years and grace, before God and men (Lk 2:52). Under this profile, Mary is presented as a model for parents, demonstrating the need for recourse to the Holy Spirit in order to find the right path in the difficult task of education. Without doubt, she was present at the outpouring of the Spirit on the day of Pentecost. The Spirit who already dwelt in Mary, having worked marvels of grace in her, now redescends into her heart, communicating gifts and charisms necessary for the exercise of her spiritual motherhood. 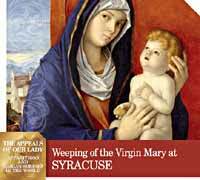 Mary participated in the life and prayer of the first Christian community. Saint Luke recounts that the community at the origins of the Church was composed not only of Apostles and Disciples, but also of women, amongst whom Luke names uniquely, Mary, the Mother of Jesus (Acts 1:14). Even now in the life of the Church, She is called by the same Spirit to cooperate in a maternal way with Him. He continually re-awakes in the Churchs memory the words of Jesus to the Beloved Disciple: Behold your mother!, and he invites believers to love Mary as Christ loved her. 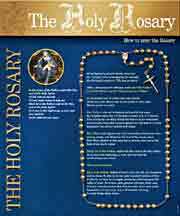 Every deepening of the link with Mary permits the Holy Spirit to act more fruitfully for the life of the Church. What is the relationship between Mary and the Church? In what way does Mary belong to the Church? She is our sister, the supereminent member of the Church. 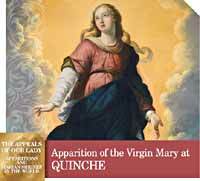 She is the first redeemed, saved by Christ in a most sublime manner in her immaculate conception (cf. Bull Ineffabilis Deus, Pius IX, Acta 1, 605) and entirely renewed and filled with the grace of the Holy Spirit. Why is Mary Mother of the Church? Mary cooperates in the birth and development of the divine life in the members of Christ, that is, us. She is Mother of the Church in the order of grace. flows forth from the superabundance of the merits of Christ, rests on His mediation, depends entirely on it and draws all its power from it (LG, 60). In what sense is Mary the model of the Church? She is the figure and the most perfect realisation of the Church. She is the model of the Church in motherhood and in virginity. by receiving the word of God in faith becomes herself a mother. By her preaching she brings forth to a new and immortal life the sons who are born to her in baptism, conceived of the Holy Spirit and born of God. (LG, 64). The Church is a virgin, who keeps the faith given to her by her Spouse whole and entire. Imitating the mother of her Lord, and by the power of the Holy Spirit, she keeps with virginal purity an entire faith, a firm hope and a sincere charity. (LG, 64). Undoubtedly she constitutes for all the highest example of purity and of total self-giving to the Lord. However, in a special way she inspires Christian virgins and those who dedicate themselves to the Lord in a radical and exclusive way in the various forms of consecrated life. She encourages all Christians to live with particular commitment a life of chastity according to their state and to trust themselves to the Lord in the various circumstances of life. She who is the Sanctuary of the Holy Spirit par excellence helps believers to rediscover their own bodies as temples of God (cf. 1 Cor 6:19) and to respect their nobility and holiness. Hence the Church, in her apostolic work also, justly looks to her, who, conceived of the Holy Spirit, brought forth Christ, who was born of the Virgin that through the Church He may be born and may increase in the hearts of the faithful also. The Virgin in her own life lived an example of that maternal love, by which it behooves that all should be animated who cooperate in the apostolic mission of the Church for the regeneration of men (LG, 65). Mary is the eschatological image of the Church, in the sense that she is already that which the Church, in pilgrimage on earth, will one day be at the end of the world. 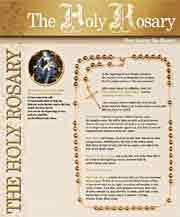 In what sense is Mary the model of the holiness of the Church? Mary is the all-holy one, being full of grace (Lk 1:28). She represents for the community of believers the paradigm of authentic holiness, which she accomplishes in union with Christ. But while in the most holy Virgin the Church has already reached that perfection whereby she is without spot or wrinkle, the followers of Christ still strive to increase in holiness by conquering sin (LG, 65). In this journey towards holiness, those who believe in Christ feel themselves encouraged by she who is the model of virtue. Piously meditating on her and contemplating her in the light of the Word made man, the Church with reverence enters more intimately into the great mystery of the Incarnation and becomes more and more like her Spouse (LG, 65). in love: thanks to Marys radiant love it is possible to conserve in every age harmony and fraternal love in the Church. 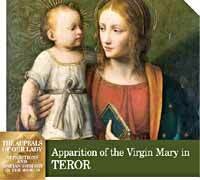 In what sense does Mary cooperate in the Redemption? Saint Augustine attributed to the Virgin the qualification of cooperator in the Redemption (cf. De Sancta Virginitate, 6; PL 40, 399), a title which underlines Marys action which is both subordinate and joined to that of Christ the Redeemer. by her obedience, faith, hope and burning charity in the work of the Saviour. The sublime fruit of this cooperation is her universal motherhood: Wherefore she is our mother in the order of grace (LG, 61). the particular contribution which she makes also to the life of the Church, of which she is Mother, through the course of the centuries and until the end of time, continuing to sustain the Christian community and all believers in their journey towards holiness and in generously working for the proclamation of the Gospel. What is the relationship between Mary and women? 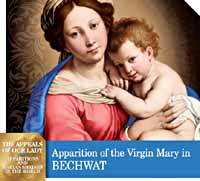 Mary actualises in herself in a paradigmatic and sublime way the two dimensions, vocations of woman: virginity and motherhood. Mary lived, in the particular and exclusive way of a woman, the union of mother and son. 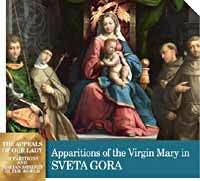 What type of veneration do we give to Mary? 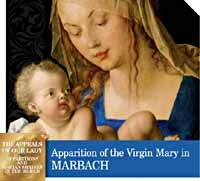 From the beginning there has always been a particular veneration for the Virgin Mary amongst Christians. However, after the Council of Ephesus the cult of the people of God toward Mary wonderfully increased in veneration and love, in invocation and imitation (LG, 66). This is expressed especially in liturgical feasts, amongst which, from the beginning of the 5th century, the day of Mary Theotokos assumed particular relevance, celebrated on the 15th August in Jerusalem and later becoming the feast of the Dormition or Assumption. The cult of Mary has developed up to our own day with a marvellous continuity, alternating between periods of flourishing and critical periods which, nevertheless, often had the merit of promoting even more its renewal. Placed by the grace of God, as Gods Mother, next to her Son, and exalted above all angels and men, Mary intervened in the mysteries of Christ and is justly honored by a special cult in the Church. (LG, 66). Such a cult possesses its own unrepeatable distinctiveness because it refers to a person unique with regard to her personal perfection and to her mission. differs essentially from the adoration which is given to the incarnate Word and equally to the Father and the Holy Spirit, and greatly fosters this adoration. The liturgical feasts dedicated to the Mother of God and Marian prayer, such as the rosary, an epitome of the whole Gospel, express this devotion to the Virgin Mary (CCC, 971). However, the veneration of the faithful towards Mary, even though superior to the veneration offered towards other saints, is nevertheless inferior to the worship of adoration reserved for God. There is, however, a continuity between the cult of Mary and that rendered to God: in fact, the honour rendered to Mary is ordered and leads to the adoration of the Most Holy Trinity. The veneration of Christians for the Virgin Mary promotes the worship paid to the Incarnate Word, to the Father and to the Holy Spirit. The various forms of piety toward the Mother of God, which the Church within the limits of sound and orthodox doctrine, according to the conditions of time and place, and the nature and ingenuity of the faithful has approved, bring it about that while the Mother is honoured, the Son, through whom all things have their being (cf. Col 1:15-16) and in whom it has pleased the Father that all fullness should dwell (Col 1:19), is rightly known, loved and glorified and that all His commands are observed (LG, 66). To she who became the Mother of the Church and Mother of humanity, the Christian people turns, enlivened by filial confidence, in order to implore her maternal intercession and to obtain what we need in this life in view of eternal happiness. Catechism of the Catholic Church, Part I, Section II.